I believe that information is power. I know that every person that uses the internet could become a victim of cybercrime. Cybercriminals are becoming much, much better at duping us and getting us to willingly give up our credit card numbers. So, as I started out with, knowledge is power and I want to offer up the following six tips to avoid becoming a victim of cybercrime. But before I give the tips, let me give an overview of what some of us are being victimized by. And, I want to stress that if you have been a victim, you are not alone. In fact, according to the 2017 Norton Cyber Security Insights Report, 10 million Canadians were affected by cybercrime last year. And the cost of this cybercrime? $1.8 billion Canadian dollars…this is not small change be any means. Consumers accessing insecure sites often get pop-ups that tell you that you have a virus, that your computer has been compromised, or even that you have committed some fraudulent activity. Of course you have not, but these criminals are playing on your fear, emotion and the hopes that you don’t have the technical savvy to realize this is a scam. 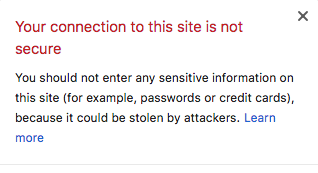 So, how can you tell that the site is not secure? One way is to look at the url or web address. If you have been an unfortunate victim of a pop-up scam, and gave your credit card, and/or control of your computer over to the scammers, they could wait a few months and then call pretending to be someone from Microsoft, Google, Norton, ….or any vendor really. Your information my have been released on the Dark Web too, which makes you an interesting target for criminals. The callers will indicate that there is suspicious behaviour with your computer and they can help you fix it. The fact is that vendors cannot legally see anything that is happening with your computer. If someone is claiming that they can see what is going in with your computer, either they are lying or they have some sort illegal access…or they are a member of the CIA, FBI, CSIS, MI5 or some other spy agency. So, if you don’t think a member of a spy agency is watching you…it’s a scam. Hang up. Don’t ever, ever, ever give control of your computer over to a caller. Don’t ever, ever, ever give any credit card information to someone claiming they can fix your computer who has called YOU (or if there is a popup on your computer). If someone calls claiming to be from your credit card company stating the your card has been used inappropriately, never give any information. The scam is that they will ask for your birthdate, your card number and some other details, maybe even your PIN or the SVC on the back of the card. Never. I repeat. Never give this information. Instead hangup and call the number YOU have for your credit card company and ask to validate a call that just came in. Don’t call the number that the potential scammer gave you. That’s how they get you. Don’t fall for computer pop-ups. If they appear, either get off the site, or disconnect from internet or shut down your computer or all of these options… Always look and use secure sites. Look for the https: and the lock symbol as shown above. If you get a call from someone claiming to be tech support, hang-up. Never give access to someone to remotely control your computer..NEVER. Never give your credit card information to someone who claims to be helping you. Remember that vendors, be it Microsoft, Norton, your service provider, etc. cannot see that something “suspicious” is happening with your computer. If someone claims that, they are lying to you. Keep your antivirus software updated, but don’t think that will protect you from everything. You need to be vigilant and follow 1-5 above. Contact your bank or credit card company immediately, if you gave your information, to advise them of what has happened. Never call the “company” again. Doing so tips them off and thwarts police investigation. Report the scam to your local police. If you gave access to your computer, ALWAYS take your computer to a professional who can clean your computer and remove viruses, malware and/or other software installed by the criminal. Not doing so could mean that the criminal installed malicious software that can record your keystrokes to get your sensitive information, or could be a virus or something else that will harm you and your data. Being on line is no different than protecting yourself in your home. You lock the doors and you don’t let strangers in. Do the same for your online safety.